My best photos aren't in my portfolio. Or, maybe I should more accurately say, photos that were my best at one point in time, have now been discarded from my portfolio because they have been replaced by newer, better work. It didn't happen all at once. One by one, they dropped like flies to be replaced by newer and better flies. As I write this, I'm currently putting together a new printed portfolio to show to potential clients and agencies. Man, it's tough, it's really tough. And it's got me thinking about the process of critically analyzing our own work and how challenging it can be. Your skin replaces itself in it's entirety fairly often, with cells constantly dying and growing. But, thankfully, it doesn't happen all at once. A few cells die here, a few new ones spring up there. The rolling count stays about the same but the content changes. The same is true with a portfolio. I'm not an expert on portfolios, so if you're here for me to say "it should look like this, and should have X number of photos," sorry. (By the way, that number ranges from like, 8 to 50 depending on who you ask). Instead, I want to coddle you and help you through the inevitable hardship of saying goodbye to your favorite work. Or, what was your favorite work. Letting go of the old work to make room for the new is hard. WE GET ATTACHED — We get attached and have a hard time letting go. We remember how much we loved a certain shot when we first captured it; We remember what it felt like to say "this is my best work" and it gets filed away in our archives and minds tagged with "best" and it takes a conscious revision to override that feeling. WE CAN BE BAD JUDGES OF OUR OWN WORK — This isn't because of a lack of talent or an eye for quality, but more that we know too much about our own work to judge it critically. We know that we spent 5 (or 50) hours trying to make it work, getting all the props, getting everything lined up right, problem solving when something went wrong, and the hours of meticulous editing. But we can fail to remember that effort does not equal results. Just because you spent a long time on something and you love it doesn't mean it's good. STAY FOCUSED — As we shoot more, we find what it is we like to shoot, and hopefully, keep shooting more of that. As we progress in that direction, work outside of that scope can seem more out of place in a body of work. I have a photo of a bird that I think is awesome and I really love. I shot it in Iceland and I have great memories surrounding it - but it makes absolutely no sense in my portfolio, so it's gone. The dancing girl was shot right after I got my first off-camera flash triggers and I discovered that I love shooting movement. The popping water balloon was November 24, 2009, the day I bought my first flash. I was in awe of the fact I could freeze water droplets like that. 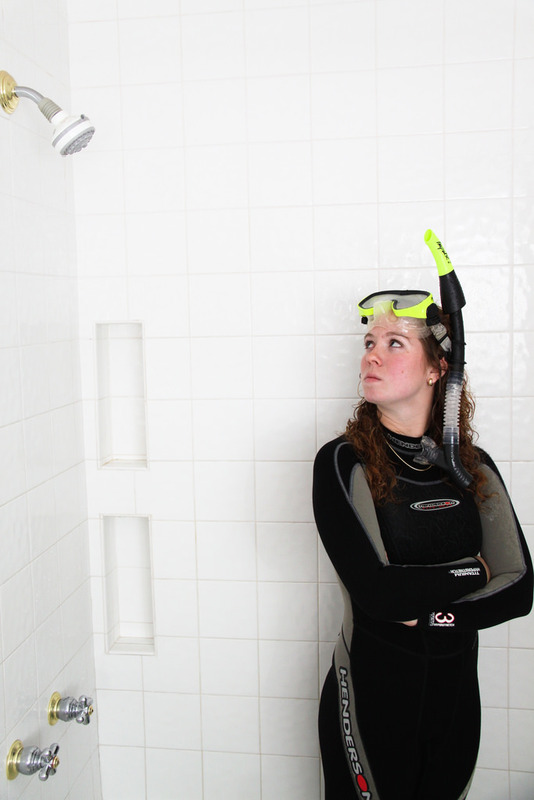 The girl in scuba gear in the shower was early experimentation with working with a concept, not just documentation of what happened to be in front of me. The narrow bridge sign was learning about long exposures. The orange was dabbling in studio product work. I used to do weddings, now I don't. I used to shoot music, now I don't. I used to take random self-portraits to practice lighting (before a "selfie" was a thing). Me sitting in the window was one of the first times I used Photoshop to stack several frames together. At one point, I was attached to these images, now I've moved on. Sure, I've gotten better and better with Photoshop, but I've also found what I like to photograph. My new work eclipses the old, and I remove what doesn't fit together. Eventually, the entire body of work is new, and that's how it should be. Only include the work you want to get hired to do more of. A portfolio is a specific body of work that should be representative of your current work, but should also be aspirational. If you shoot a ton of weddings, but hate it and want to do more portraits, go shoot portraits and put those in your portfolio and show that to people. Work begets work, and if you don't show that you shoot a certain subject, the likelihood of getting hired for it is very low. Don't rest on your laurels. It might sound scary, but if you're on the fence about an image belonging in your portfolio, it probably doesn't. Just get rid of it. Wait 5 minutes and see how you feel. I find myself in moments of bravery where I'm able to be ruthlessly honest with myself. That's a perfect time to say goodbye to the images that have served their purpose, and send them off to the spirit in the sky. Caleb Kerr is a professional commercial photographer based in Austin, Texas, specializing in lifestyle, sport, and fitness photography. Keep up on Instagram, sign up for his mailing list, or shoot him an email at hello@calebkerr.com.